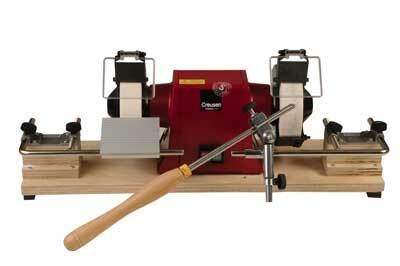 Tormek are known for their superb wet grinder/sharpening units and their purpose-made accessories. Some turners have Tormek sharpening systems and some a dry grinder, but many people using dry grinders wish they could use the Tormek accessories. Now, the BGM-100 allows you to do so. The BGM-100 is effectively the support arm - used on their wet grinders - a mounting base and a comprehensive instruction manual. To use this one requires a base for the grinder to be fixed to (plywood works well), and a platform onto which is fitted the mounting base, which you need to make yourself to suit the centre-height of your grinder. These can also be made from ply. which are optional accessories for this model. The arm is adjusted in and out by slackening off the locking screw and either manually pulling or pushing, to create the correct gap between the arm and the wheel, or by using the fine micro-adjusting dial on the threaded part of the arm. The BGM-100 allows you to utilise all of the Tormek sharpening/grinding accessories for turning tools. 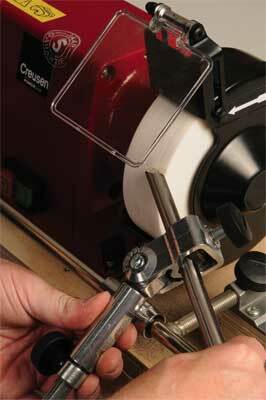 This solution can also provide some cost saving options if you have the Tormek wet-sharpening system, too. In conclusion, I found it effective, simple-to-use, and, with the addition of a couple of accessories, very versatile.